100% pure Grapeseed Oil, hypoallergenic and suitable for sensitive skin. A very fine and light oil which is easily absorbed by the skin and is suitable as a moisturiser whatever your skin type, leaves the skin soft and smooth. Contains Fatty Acids, natural Linoleic Acid, vitamins E, C and Beta Carotene, and Omega 3,6 and 9. Grapeseed Oil has been known to improve the appearance of aging skin. Used for massage, aromatherapy, skincare, hair conditioning, face cleansing and as a natural make-up remover. Often used as a carrier or base oil combined with essential oils to create various beauty treatments. Not tested on animals and vegan friendly. Packaged using sustainable paper and cardboard. Kind to you and the environment. Skincare: Grapeseed Oil is often used to hydrate the skin, leaving it soft and hydrated without feeling greasy. Its fatty acid and vitamin content make it useful as a remedy to reduce the appearance of wrinkles and improve skin texture. This oil might also help to protect the skin from adverse weather conditions. When applied to the eye area Grapeseed Oil may help reduce the appearance of dark circles and bags under the eyes. It can also be used as a cleanser and a make-up remover. Massage: May have a firming effect on the skin and help reactivate the microcirculation, especially on areas such as the neck, arms and legs. It is also considered beneficial for helping with varicose veins, promoting good blood circulation and reducing and preventing stretch marks, especially when combined with Rosehip Oil. Haircare: Helps hydrate the hair, making it stronger, especially during the summer. An intensive mask made with Grapeseed Oil may be effective to combat dry hair. 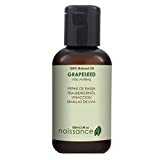 Properties: Grapeseed Oil leaves the skin with a smooth, satin finish. As the oil is hypoallergenic it is suitable for sensitive skin and is ideal for oily skin as it will leave your skin soft and not tacky. It is used in many skin creams and other cosmetics. All vegetable oils & fats are 100% fat and are generally high in calories (on average about 120 calories per tablespoon). Vegetable oils are often used in food preparation for salad dressings, cooking, frying, baking, sauces and marinades. As a general guide, virgin and unrefined oils have more of the oil’s natural flavour and lend themselves well for use in cold dishes. Refined oils generally have longer shelf lives and may have a higher smoke point and therefore be better for high heat cooking, but this varies depending on the type of oil. Each oil has its own distinct flavour and nutrient and Fatty Acid composition, so each oil may be used for different purposes depending on your need.